Don’t let this virgin with the underbeard fool you. 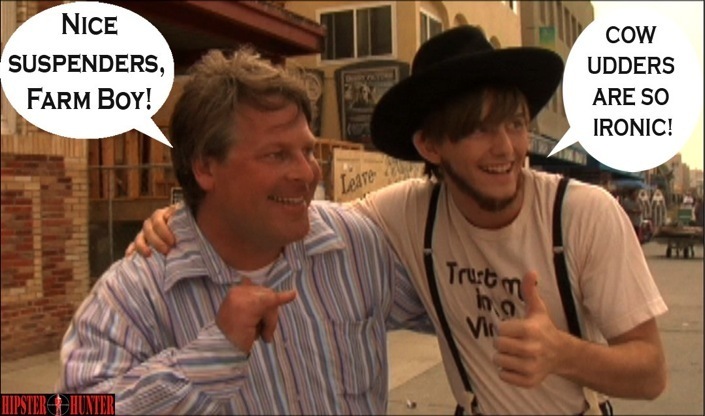 He’s on his Rumspringa and full fledged hipster. Too bad there’s no irony content in the cows he milks. And I hate to break it to him, but suspenders are unneccesary with tight hipster pants, Amos. Let’s hope he returns to Amish country before it’s too late. The jury is still out as to whether hipsteritus can infect the stoic Amish. If it can, God help us all! PRETENSION: 1, He is just learning, but give the boy time. HIPSTER-POCKET: To unofficially a hipster’s career, which may or may not include a piece of the pack of pretzels they steal from the corner store.